When my husband and I began dating, we lived six hours apart. Since we didn’t get much time for face-to-face conversations, we had to find creative ways to communicate. This, of course, included long telephone calls and e-mails, but we also took advantage of the U.S. Postal Service. I have a box full of old letters, decorated envelopes and pictures sent during the year and a half we were apart. My favorite one is a picture of Ryan standing with his arms spread out in a field in Ireland with a note promising to take me there someday – I’m holding you to that Ryan! Once I moved to Minnesota, and especially once we got married and lived under the same roof, the notes stopped. Unless we are letting the other know if Murphy has been fed or that the dishes in the dishwasher are clean, our handwritten correspondence has pretty much come to an end. But recently, I decided to resurrect this dying art form. It has been a rough few weeks for Ryan. Between layoffs at his company and his beloved Green Bay Packers blowing another chance at going to the Super Bowl, he’s been a little down. So I decided to pack a little treat into his lunch to help cheer him up. His lunches typically consist of a sandwich and bags of fruits and veggies (I thought after living with him for this long some of his healthy eating habits would wear off on me…not so much). 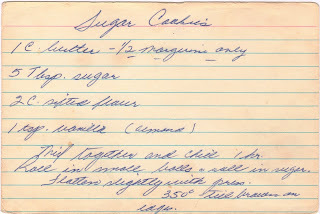 This menu definitely needed some sweetening up so I consulted the recipe box and found just the thing: Sugar Cookies. I love this recipe. These aren’t typical sugar cookies. Instead of being a dense, heavy cookie, these are light and airy and have a hint of shortbread in them. I bagged up a few, attached a little note wishing him a sweet day from Murphy and me, and tucked them into his lunch tote before he left for work. The next morning, Murphy and I had a note waiting for us on the kitchen table thanking us for the cookies. It was a great way to start the day. It seems these days that communication is shifting more towards Facebook posts and text messages. But there is just something so much more personal and thoughtful about a handwritten note. Maybe being a writer I have more of a vested interest in the art – I keep journals that I write in everyday. But I also send handwritten cards for birthdays and to say thank you. Everyone loves to get mail and it makes me happy to see the distinct marks of my loved ones’ handwriting when they signed the card. It’s as if they packed a little piece of themselves in the envelope and sent it as part of the greeting. So this year for Valentine’s Day, I challenge all of you to make a treat for a loved one and include a handwritten note. And if you prefer chocolate over sugar cookies, I highly recommend the caramel bars. Each decadent bite is sure to leave a smile on their face and a sweet thought of you in their mind.